“What is paranoia? Just another form of literary criticism”. 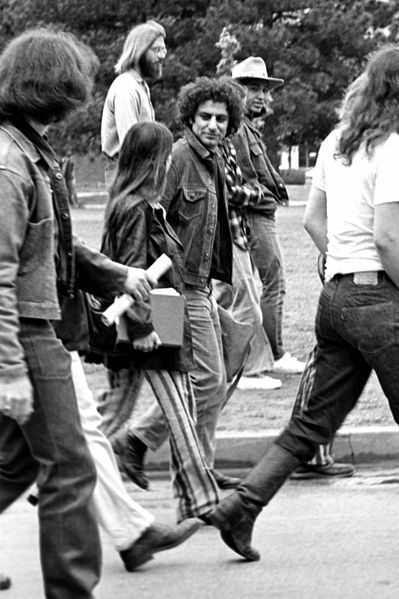 Attributed to Abbie Hoffman, image from Wikipedia via Creative Commons license. “People call me a conspiracy theorist for saying that Obama signed the NDAA military detention act because the Occupy Movement had started. And I say to them, if you DON’T believe the two things are connected, then YOU are a COINCIDENCE theorist”. (note–that is not original with me. I think the sentiment was first stated back in the 1960’s by the late Abbie Hoffman). We are now awash in conspiracy theories surrounding the Boston Marathon bombing and the two alleged bombers, Dzhokhar Tsarnaev and his dead brother Tamerlan. On Wednesday, Huffington Post invited posters to excoriate New Hampshire state legislator Stella Tremblay (R) after she posted on Glenn Beck’s Facebook page supporting Beck’s theory that the Boston bombing was a US government ‘false flag’ operation (she quoted Infowars, the Alex Jones conspiracy theory juggernaut). Interestingly, posts on HP’s discussion board that gave any sort of grudging cred to her (or posts that condemned this particular individual but admitted there’s a conspiracy problem in the US) were immediately scrubbed. Ever since HP was sold to AOL, there’s been an increasingly heavy hand on the posting ability of people–and folks with views outside of the ‘acceptable’ bounds have been filtered out. And HP is hardly the only organization trying to shut down discussion of conspiracies–last night Rachel Maddow derided a whole group of conspiracy theories (including the 9/11 truth movement) to arrive at her point that the people questioning the reporting about Boston are right wing kooks. This is going on even as we’re finding that parts of the Boston narrative voiced as gospel truth a few days ago are falling apart. Boston Police Commissioner Ed Davis has now admitted that Dzhokhar Tsarnaev was unarmed when he was captured while hiding inside a boat. Remember, he said earlier that shots were fired from inside the boat. Ed Davis has said a lot of things, including that the suspect shot himself (in the neck), in the boat. He also said that Dzhokhar ran over his brother Tamerlan, but eyewitnesses say the police ran him over and then shot him. Davis also said they were throwing “bombs’ from a speeding vehicle. How about some dash cam footage? (post from HP). And I briefly saw some very disturbing few seconds of video that has been subsequently removed from YouTube. I believe it was from a Boston FOX affiliate, and it showed two policemen walking past a pile of clothes lying in the blood-filled sidewalk around the blast. And after the policemen passed, the clothes disappeared–it was as if someone had forgot to re-edit the image after they had passed. Even the news correspondent commented on the footage, which has now disappeared. And we already know that the Daily News Photoshopped a cover picture it used. And I don’t buy the excuse the editor gave that they were attempting to ‘soften the images’. As I posted a few days ago, these pictures were and are inflammatory–but we weren’t treated to similar images in any of our recent mass murders by assault weapon. People who’ve read my earlier posts know that I’ve given some pixels to the Architects and Engineers for 9/11 Truth group. I have very little trust in most of the people in the 9/11 Truth movement, but these are people with credentialed credibility who are questioning the scenario of the collapse of WTC 7. They’re taking a professional risk by signing on with those who want a new investigation on the flawed science of the original 9/11 report, which never addressed the collapse of WTC 7 (which also leads to questions about the collapse of the twin towers). I am not an engineer or a metallurgist. But Rachel Maddow isn’t either–on other topics she has covered, she has admitted that she is not the expert (though she’s undoubtedly smart–a Rhodes Scholar) and deferred to her guest. And part of the problem of painting all of the people in a given movement with the same brush is that it lumps in the deranged attention seekers with the cogent rational people making reasoned arguments. I’m not a fan of Alex Jones, but I would agree with him on one point–I think the Main Stream Media are falling in line on a number of troubling issues surrounding this and other events. The problem is also with reporters deriding folks who present alternate points of views. One thing to keep in mind for those of you who didn’t experience the 1960’s first-hand is that American law enforcement has worked to create disinformation in order to discredit movements with validity. If 300 people at a demonstration are calling for a new investigation of 9/11 based on metallurgy and 5 are talking about how the planes that hit the Trade Centers are ‘holograms, man’, the movement is lumped together. So if you’re a government official and you want to discredit a movement, you make sure the ‘holograms, man’ people have bus fare to the demonstration. And you also try to get friendly media to interview those folks at length on camera. Google COINTELPRO. And the other problem with dismissing conspiracy theorists is that frequently the conspiracy theorists are right. The 60’s era folks who were derided as hopeless loonies for suggesting that Richard Nixon sabotaged the Paris Peace talks in order to win the 1968 election are exonerated by history now that the LBJ library has declassified its files. The government WAS infecting African American men with syphilis years ago. Everything about the Gulf of Tonkin ‘attack’ that propelled us into Vietnam was a fabrication. I and other anti-war activists were vilified by people in ’02 and 03 for suggesting that W was cooking the case for war with Iraq–nobody apologized now that we’re pretty sure that’s exactly what he was doing. And a jury decided that the government was involved in the assassination of Martin Luther King. Last week I posted some information about Chechnya. I got some things wrong, and some of it was not emphasized enough–after the assassination of Dzokhar Dudayev, the leader of the movement, the Russians were able to quash efforts for Chechnya’s goal of an independent state. The country became ripe recruiting ground for terror and terrorists, and there were plenty of Chechen terror attacks on Russia in the following years. Those included radical Islamists. But the story is still unfolding. It should not be a ‘finished’ story, and once it’s implanted as the ‘final version’, people are going to accept it, mistakes and all. This country is continuing to embrace alternate versions of reality. That’s not good for democracy or civics–when a country can’t agree on reality, what else can the citizens find for common ground? And when questions are left to fester, it creates a corrosive attitude of distrust. Let’s go slow on the investigation here before we drag ourselves into another war based on lies. Its such as you learn my mind! You appear to know so much about this, such as you wrote the e-book in it or something. I think that you can do with a few % to force the message home a bit, but other than that, that is great blog. An excellent read. I’ll certainly be back. ← Obama ducks a drone hearing!